Caroline C. Ansay, 75, of the Maple Crest Apartments died Wednesday, May 16, 2007 at Columbia St. Mary’s Hospital, Ozaukee Campus in Mequon, Wisconsin. She was born on July 1, 1931 in Port Washington to Richard “Pops” Bossler and Margaret Pesch. She married Arnold F. “Arnie” Ansay of Holy Cross, Town Of Belgium, on September 29, 1951 at St. Mary’s Church in Port Washington. They raised their family on E Prospect Street in Port Washington. In 2005 she moved to Maple Crest. Caroline worked at the former Badger Outerwear in Port Washington and at Power Products in Grafton. She retired in the early 1990’s from the shop at Port Publications after 25 years. 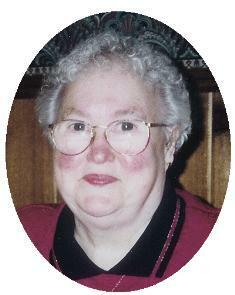 She was a member of the St. Mary’s Christian Mothers and enjoyed playing cards with the ladies and loved her cats. She is survived by her husband Arnie, children Gerald “Jerry” Ansay of Fredonia, Barbara (Paul) Prochaska of Port Washington, Jayne (Marvin) Kolbach of the Town of Port Washington and JoAnn (Lewis Howard) Ansay of Willis Texas. Futher survived by 8 grandchildren, 4 great grandchildren, sisters Hiltrude (Norbert) Federspiel and Bernice (the late Francis) Winnemuller both of Port Washington; other relatives and friends. Preceded by brother John “Butch” and Jerald “JT” Bossler and a sisters LaVerne Redig and Helen Eich. The Rev. Patrick Wendt will celebrate Mass of Christian Burial 7 pm Friday, May 18, 2007 at St. Mary’s Catholic Church, 430 N Johnson Street, Port Washington. Cremation with final interment at St. Mary’s Cemetery. Visitation 4 – 7 pm Friday at St. Mary’s Church.